Rahul and Priyanka Gandhi: Siblings unite, but will it change the Congress’ election fortunes? 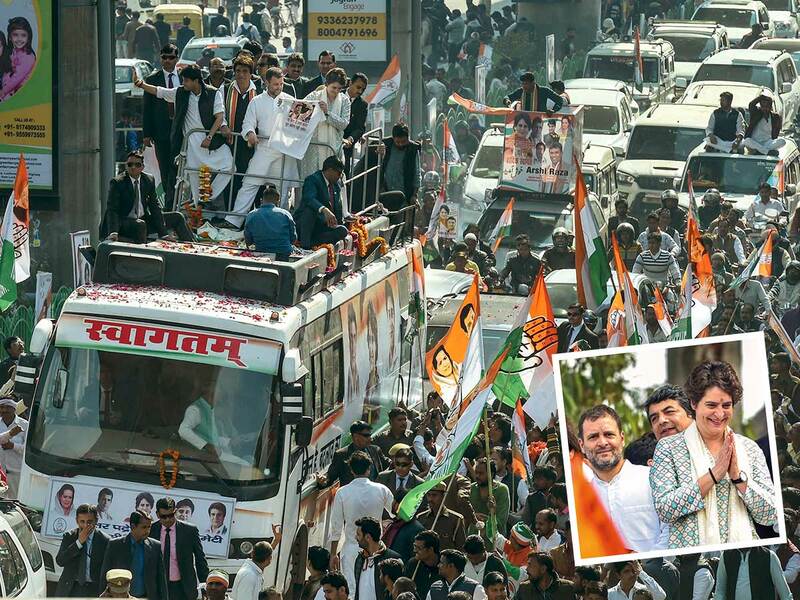 Lucknow: Priyanka Gandhi Vadra, the popular sister of the head of India’s main opposition Congress party, made her political debut on Monday with a roadshow drawing thousands in the most populous state months before a general election due by May. She will also be its face in Uttar Pradesh, the state that sends the highest number of lawmakers to the lower house of parliament and is currently dominated by Prime Minister Narendra Modi’s ruling Bharatiya Janata Party (BJP). But a string of BJP defeats in state elections late last year and rising discontent over a weak farm economy and lacklustre jobs growth have weakened Modi’s position, which an increasingly aggressive Congress is looking to capitalise on. The 47-year-old Priyanka — she is usually referred to by just her first name — bears a striking resemblance to her grandmother, former prime minister Indira Gandhi, and is known for her gifts as a speaker able to connect with voters. Congress hopes that the eyeballs she’s able to generate will turn into votes. I have hope in my heart that together we will start a new kind of politics, a politics in which all of you will be stakeholders — my young friends, my sisters and even the weakest person, all their voices will be heard. Come, let’s build a new future, new politics with me. Posters of Priyanka lined the streets of the state capital, Lucknow, and hundreds of Congress supporters, accompanied by drummers, chanted her name after she emerged from the airport with her brother. The siblings later waved at supporters from atop a bus as it slowly made its way out of the airport for the 20km roadshow. Security personnel had a tough time holding back enthusiastic crowds as her convoy wound its way amid full-throated slogans hailing Priyanka. “The storm is coming, Rahul along with Priyanka Gandhi,” was a favourite among supporters, many of whom wore caps and T-shirts with Priyanka’s picture embossed on them. Described by Congress officials as a gifted orator and a strong manager, Priyanka has been entrusted with resuscitating the party’s organisation in the state, where it has endured a succession of crushing results. Congress officials hope Priyanka’s entry into politics will improve its chances across Uttar Pradesh, a vast agrarian state of 220 million people that the BJP nearly swept in the last general election in 2014, winning 73 of the 80 seats there. Although Priyanka has helped manage elections for her brother and her mother, former Congress chief Sonia Gandhi, she has never held an official party post until now. Since the announcement of Priyanka’s entry into politics, India’s financial crime-fighting agency Enforcement Directorate has questioned her husband, Robert Vadra, for several hours in a case relating to alleged ownership of $2.45 million (Dh9.2 million) of undisclosed assets abroad. His lawyer and Congress have dismissed the charges as politically motivated. 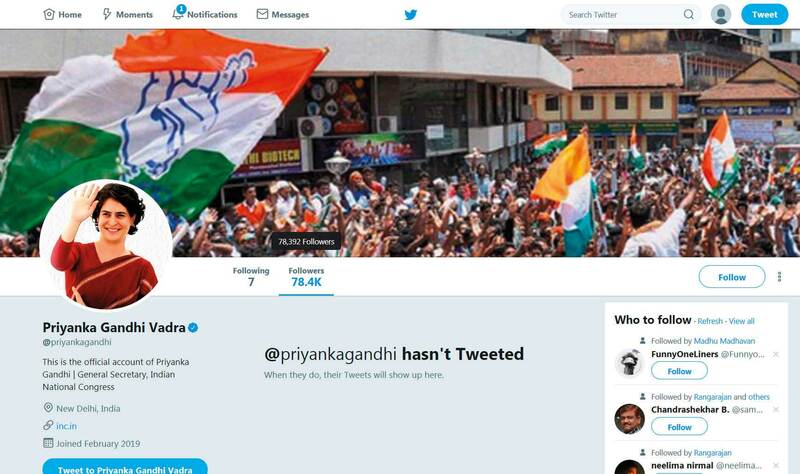 India’s Congress party general secretary Priyanka Gandhi Vadra on Monday joined Twitter and garnered a massive response with tens of thousands following her on the social media platform within hours. Her logging on to Twitter with the account @priyankagandhi came on the day of her maiden visit to Uttar Pradesh as an AICC general secretary. She didn’t post a tweet, but followed seven people, including her brother and party chief Rahul Gandhi as well as party leaders Jyotiraditya Scindia, Sachin Pilot, Ashok Gehlot Randeep Singh Surjewala, Ahmad Patel and the Congress’s official account. Robert Vadra on Monday urged people for safety of Priyanka Gandhi, his wife and Congress General Secretary, saying the political atmosphere is “vindictive and vicious”. His remark came ahead of Priyanka’s first road show in Lucknow. “There is a very vindictive and vicious political atmosphere... But I know, it’s her duty to serve the people and now we hand her to the people of India. Please keep her safe,” Vadra said on Facebook. Meanwhile, the Enforcement Directorate will continue to question him again on Tuesday in Jaipur in connection with a money laundering case involving a Bikaner land deal. A Shiromani Akali Dal (SAD) leader said on Monday that Congress President Rahul Gandhi’s “political obituary” had been written with the launch of his sister Priyanka Gandhi Vadra into active politics. “Today, the political obituary of Rahul Gandhi has been written,” Bikram Singh Majithia told media. Majithia, who is federal Indian food minister Harsimrat Kaur Badal’s younger brother, said that by launching Priyanka, the Congress party has itself admitted to the political failure of Rahul Gandhi. “The Congress has admitted on its own that Rahul is a failure and things are not working [for the party]. So they have brought in the sister now. The writing is on the wall for the Congress,” Majithia, a former cabinet minister in Punjab, said.